Ditch the MSG laced gelatin and sugar packed flavouring found in conventional jello snacks. Instead make your own strengthening and hydrating version! Caution: may cause silly childlike grinning to occur! 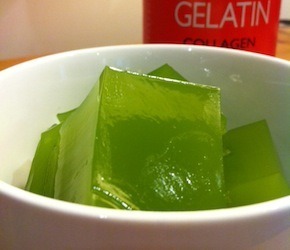 Stir gelatin into room temperature water. Add hot water and electrolyte powder and stir until dissolved. For colour, blend chosen vegetable/fruit in a little water and strain into jello mixture (don’t use more than a few tablespoons without adding extra gelatin). Pour mixture into chosen dish and cool in fridge until set. For berry flavoured jello try using raspberries, cherries or beets for colour. For lime flavoured jello use any leafy green or a drop of chlorophyll.